Do you have a forthcoming dinner party or social get-together planned with friends? Tempting though it may be to go all out to impress with a diverse range of sushi roll creations, it simply isn’t practical or cost-effective when catering for a small number of people. The key to cooking a sushi dinner platter is to do less – that is, creating the illusion of variety without spending too much money on ingredients, or devoting too much time to the job in hand. Additionally, you’ll also cut down on the amount of waste from preparing a variety of sushi rolls, which in itself can be expensive. 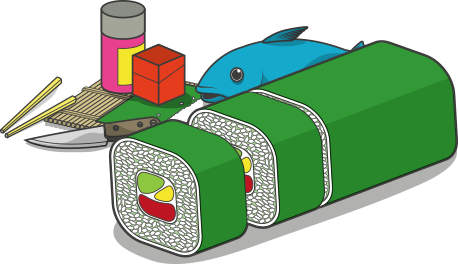 In the interests of convenience and simplicity, it’s better to choose one primary sushi roll from which you can make a number of derivatives, such as the Mosaic, Flower or Deep Fried Sushi Rolls. The illusion of variety can then be achieved quickly and simply by adding different toppings. Using the recipe below, Chef Devaux shows you how to adapt a basic salmon and cucumber sushi roll in a matter of minutes with just a few alternative toppings and condiments. Having first wet your fingers with a little cold water, transfer the cooked white sushi rice onto your half nori sheet. Use the tips of your fingers to fluff out the rice, covering the entire surface area of the nori sheet. Encase the bamboo rolling mat in a zip lock bag, then lay flat on your chopping board. Flip the entire half nori sheet over, and lay rice-side down on top of the rolling mat. Arrange a single strip of sushi grade salmon across the length of the nori sheet, approximately 2-3 cm in from the edge closest to you. Position a few strips of cucumber in front of the salmon strip, adding enough strips to span the length of the sheet. Carefully lift the edge of the rolling mat closest to you with both hands. Position your thumbs on the underside, then gradually curl it over the sushi roll, using your forefingers to keep the sushi roll filling in place. Press firmly along the top, and the far edge of the mat to compact the ingredients. Release the edge of the mat, then curl over again and compact the contents of the roll by applying firm pressure with your fingers. Keep the edges of the rolling mat flat to achieve a square shape. Return the sushi roll to the chopping board, bearing the weight with both hands so it doesn’t fall apart. Next, cover the sushi roll with a strip of cling film, using the rolling mat to shape it around the roll. Using a Miyabi (or similarly sharp) chopping knife, cut the sushi roll first into halves, and then into quarters. Segment the quarters further by slicing them evenly in half – or into thirds depending upon the size required. Note: If the segments have become a little misshapen while cutting, use the rolling mat to firm them up as before. to the delicate flavors of cucumber, salmon and sushi rice. Masago too balances the delicate flavor of salmon with other additions. Masago wasabi, often used as a colorful garnish in Japanese sushi recipes, is far more subtle in flavor than wasabi alone, therefore is ideal for newbies to sushi. seeds onto a plate, then roll each sushi roll segment over until the outer layer of the rice is entirely covered. The moisture from the rice will help the seeds/ panko to adhere. A sushi dinner party is a social event, therefore first impressions really count. Give your sushi rolls the ultimate wow-factor by presenting them on a sushi boat, or similarly novel display item topped with spiral cucumber and carrot garnish. Arrange your sushi segments in rows of contrasting color, and add a small ramekin of soy sauce or wasabi to serve.